For the third straight year, Attorney Michael S. Keating of Keating Law Offices, P.C. in Chicago, Illinois has been named to SuperLawyers Magazine's annual list of "Rising Stars." Mr. Keating was previously named a "Rising Star" in 2011 and 2012. 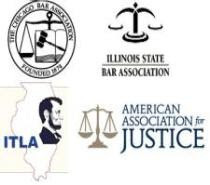 Only 2.5% of the Lawyers in the State of Illinois are named to this list which will be published in the annual edition of Illinois SuperLawyers Magazine and in the February 2013 edition of Chicago Magazine. Mr. Keating has also been named to the "40 Under 40" list of top young trial attorneys in Illinois by the National Trial Lawyers Association. Mr. Keating was nominated by fellow attorneys and that nomination was reviewed by an attorney-led research team that reviews the credentials of potential candidates and assigns points based on a set of defined evaluation criteria. The point totals from the general survey and research process are then added to arrive at a final tally. Mr. Keating practices with the Chicago-based firm of Keating Law Offices, P.C. which he founded in 2008. The firm concentrates its practice on personal injury and wrongful death cases stemming from transportation negligence, nursing home negligence and abuse, medical malpractice, premises liability and product liability. Keating Law Offices, P.C. may be found on the internet at www.KeatingLegal.com. The firm is located at 79 West Monroe, Suite 1024 in Chicago, Illinois. Phone: 312-239-6787. Deciding that a family member or loved one would be better off living in a nursing home or other type of long-term care facility is a difficult process. When you entrust your loved one to the care of a nursing home or long-term care facility you expect that they will be treated with respect and dignity in a safe environment. Lots of careful research goes into selecting the facility or home that will best serve the health, physical and emotional needs of your loved one. Unfortunately, there are some facilities that continue to violate their legal and ethical duties to take care of their residents. The state of Illinois has many safeguards in place to protect the rights of residents and patients of long-term care facilities, such as nursing homes. All Illinois nursing homes must be properly licensed and certified to remain in operation. One of the most important tools in protecting residents is the annual inspection process that all Illinois long-term care facilities must pass in order to maintain their license. Both these inspections and the licensing process as a whole provide an important opportunity for concerned family members, and residents themselves, to bring attention to any problems in a facility or nursing home. Problems may include unsafe physical conditions, substandard medical treatment, or specific incidents or abuse or neglect towards residents. If you, or a family member, have concerns about how you are being treated by a nursing home, keep written notes. These notes can be shared with facility inspectors and can be used to identify problems and areas of concern within a facility. Residents, and their relatives, can request private meetings with inspectors. This can be a confidential and safe way to convey concerns to the inspectors without having to worry about "problems" or retaliation from the facility or its staff. All facilities are required to display their annual inspection results and to make copies of the previous five years' reports available upon request. You do not have to wait for the annual inspection to report nursing home abuse or neglect. If you, or a relative, has been the victim of abuse or neglect in an Illinois nursing home or long-term care facility you can go to Illinois' website for reporting abuse here. If you, or a relative, have been the victim of abuse or neglect in an Illinois nursing home you may be entitled to bring a claim against the facility. The attorneys of Keating Law Offices have successfully represented victims of nursing home abuse and neglect. If you have any questions about this post, or any issue about Illinois personal injury law, please contact Illinois Nursing Home Abuse and Neglect Attorney Mike Keating. You can reach him 24 hours a day, 7 days a week by calling 312-208-7702 or emailing him at MKeating@KeatingLegal.com. All emails and phone calls are returned promptly. All initial consultations are confidential and free. Hearing about a "nursing home" usually brings to mind a vision of a retirement community where senior citizens can live in a relaxing group environment. In an ideal nursing home there is plenty of socializing amongst residents and the staff is always available to assist with basic medical needs and the tasks of everyday living. Despite the phrase "Nursing Home" in its title, Illinois' Nursing Home Care Act (210 ILCS 45) actually protects residents and patients of all types of intermediate and long-term care facilities in Illinois. The rules and obligations in the Nursing Home Care Act apply to any facility which houses three or more people who are receiving "personal or medical care, including but not limited to mental health treatment, psychiatric rehabilitation, physical rehabilitation, and assistance with activities of daily living." (210 ILCS 45/1-113 and 1-122). Whether due to a relative's aging-related decline in health, a developmental disability or rehabilitation from an injury or illness, more families than ever rely on these types of facilities to provide a home and care for their family members. The Illinois Nursing Home Care Act, along with similar federal laws regulating nursing homes (42 CFR 483), provides fundamental protections that ensure residents are attentively treated with the dignity and respect that we would all want our family members and loved ones to be shown. The ultimate goal of these laws it so prevent residents from becoming victims of harmful abuse or neglect while living and receiving assistance in a long-term care facility. If you, or a family member, are a resident of a long-term care facility is it important that you know all of your rights. While some of the duties of intermediate and long-term care facilities are fairly obvious you may not be aware of all of your basic rights. If your family member or loved one has been denied any of these rights while residing in an Illinois nursing home or long-term care facility you may have a legal claim against the facility. The attorneys of Keating Law Offices have successfully helped victims of nursing home abuse and neglect. We have the experience to help you if you too have been harmed while residing in a long-term care facility. 1. Freedom from all types of abuse and neglect, including any type of physical, mental or emotional harm. 2. Protection from abuse or harm committed by fellow residents. 3. Timely medical treatment and hygienic care, including any necessary follow-up care. 4. A safe environment free from dangerous physical conditions or obstacles. 5. Access to daily activities - it is against the law for residents to be kept isolated without cause. The attorneys of Keating Law Offices have successfully obtained a settlement on behalf of a client who was the alleged victim of neglect by a Chicago-area nursing home in which he was a resident. The incident took place at a nursing home on the Far North Side of Chicago in February 2011. The claim alleged that the elderly resident was injured as a result of the nursing home’s failure to provide him with proper medical treatment. It was alleged that the nursing home staff members injured the resident when they improperly treated him for an existing illness. This injury caused the resident’s condition to rapidly worsen, causing him severe pain and suffering. An Illinois nursing home that fails to provide adequate medical treatment to an injured or ill resident is in violation of both Illinois and federal laws. Under the Illinois Nursing Home Care Act (210 ILCS 45/1-101 (2011)) all nursing homes and other long-term care facilities are required to treat their residents with the same level of care that a reasonably careful nursing home or facility would have used in the same situation. Any treatment given must not only be medically appropriate but also must be given in a timely manner. When a nursing home denies proper medical treatment to a sick or injured resident, as the nursing home in this case was alleged to have done, it may be liable. The attorneys of Keating Law Offices are committed to protecting the rights of residents of nursing homes and other long-term care facilities in Illinois. Our firm has successfully represented victims of nursing home abuse and neglect. If you believe that you or a loved one have been the victim of neglect due to improper or inadequate medical care by a nursing home, please contact our firm. Pursuant to the terms of this settlement agreement, the identity of the parties, the name of the nursing home, and the amount of the settlement are strictly confidential and no further details may be disclosed. If you have any questions regarding this post, or any issue involving Nursing Home Abuse and Neglect, please contact Illinois Nursing Attorney Mike Keating — by calling 312-239-6787 312-208-7702 (Nights/Weekends) or emailing him at MKeating@KeatingLegal.com — 24 hours a day, 7 days a week. All emails and phone calls are returned promptly. All initial consultations are confidential and free.